Asian Kitchen: Located right around the corner from State Street, Asian Kitchen offers a menu of all your favorite Chinese-American cravings from fried wontons to lo mein you can devour out of the box. It is open until 12am on week days, and 3am on weekends. Wings Over Madison: Buffalo Wild Wings has inconvenienced us all by not offering delivery. Luckily, Wings Over Madison boasts the BEST wings that will surely leave you drenched in the sauce of your choice. It is open until 1am on week days and 3am on weekends. 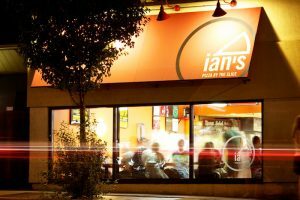 Ians Pizza: When I said cheesy and greasy, I was alluding to the famous serve-by-the-slice pizzeria, Ians Pizza. They offer anywhere from Mac n Cheese pizza to classic pepperoni, and even offer mini goodie-bags of puppy chow heaven. They are open until 2:30am on week days and 3am on weekends. While I am unsure if they offer delivery this late, GrubHub always has your back. So go ahead you little hungry paper-procrastinating night owl, give them a call and thank me later.